I have been wanting to do some posts like this for awhile, but like always, busy busy busy! 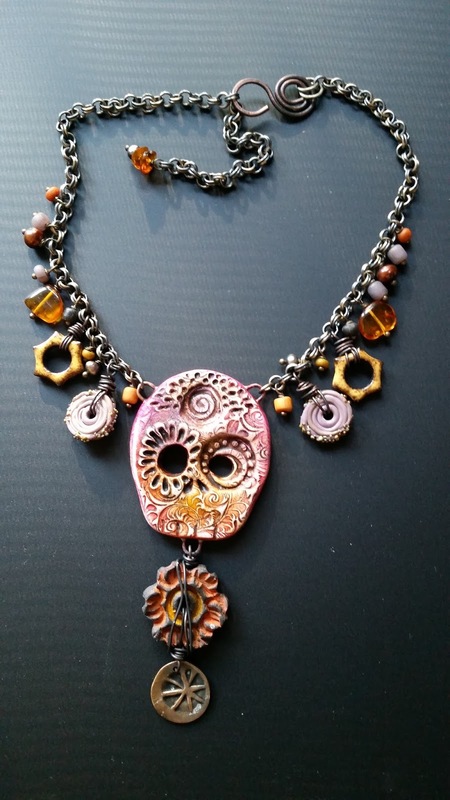 I have a bunch of Sugar Skull focals in the shop, as well as some other focals similar to the sugar skulls, and I wanted to give you guys some idea of what you can do with them. I had a few laid out on my desk, as I am prepping for a show this weekend, not sure what to do with them. At first I wanted to just add chain and a dangle and keep them super simple. But it was too simple.............so I planned to add charms to the chain. 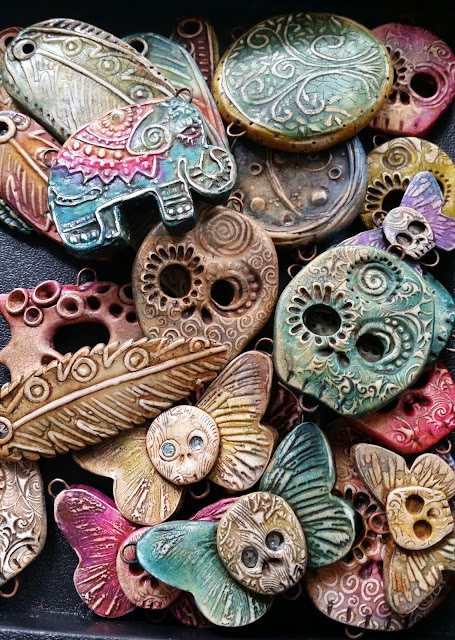 I wasn't sure how much to do charm wise, and was sort of thinking they needed chunky charms. and seeing her little dangles sealed the deal for me. That is what my plain old necklace needed. Just some simple dangles. 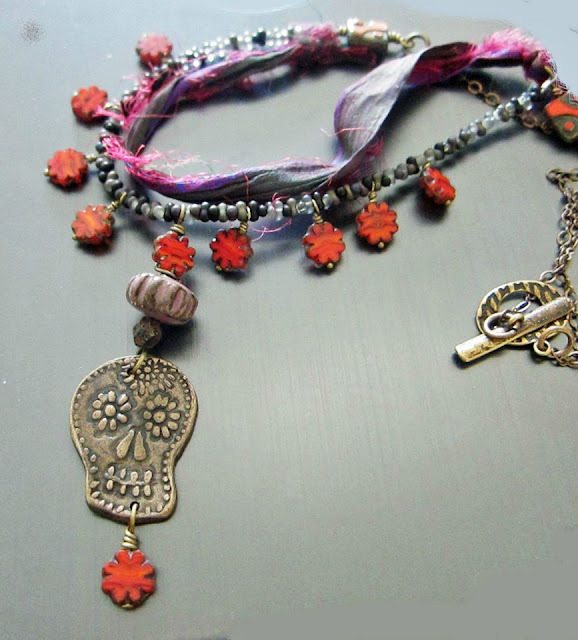 It really captures the Dia de los Muertos feel I think. And I added my chain, and picked out charms to accent the colors in my skull, and voila! I love the results! So here are my tips when doing a charm style necklace- not quite a tutorial, but this should help if you tend to struggle with them. 5. Fill the links you skipped with tiny beads to create movement and fill the space without them bumping into the other beads causing them to lay inccorectly. 6. Try to use beads of a consistent thickness. if you use beads that are tooooo round they will stick out when you wear it and roll around. And there you have it. A simple necklace that is not too plain, not too much! I haven't taken this one off yet and I cannot wait to design the others on my table. 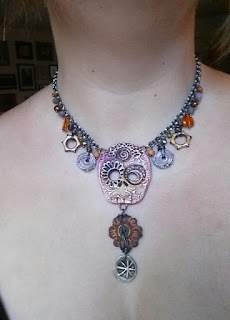 Remember, you too can make some "charming" necklaces using the components in my shop. 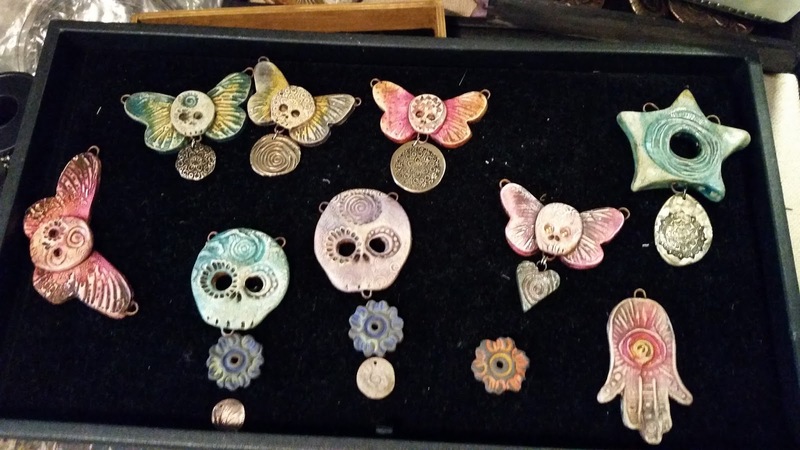 Lots of sugar skulls left. I love taking the form of a skull and making it pretty. So fun!